This is an independent Community Lunch which takes place once a month at The Community Hall on the fourth Wednesday of the month at 12.30p.m. There are three people involved Edward Tanner, organizing with Rachael the catering side, Mary Tucker Secretarial and Richard Evans Treasurer. The thought materialised as how we were going to reach people who where on their own and do not get out to mix with any other organizations throughout the area. Come and join us we hope you will be made very welcome. 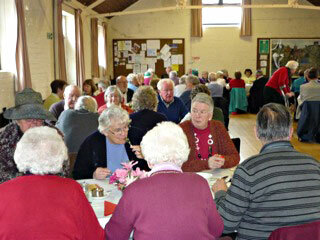 We all enjoyed a lovely lunch and it was great to see so many faces there. Once again one cannot give enough thanks to all those who volunteer every month. There are some people who have been on the sick list we wish them all a speedy recovery. We held our AGM after the lunch, and the chairman expressed he would like to see a few more attending the lunch. The organisation had been running six years. He hanked the ladies who sat on the door and did the entrance tickets and draw. The treasurer gave the financial report expressing we were 28% down on attendance From when we had started. The draw had kept our balance afloat so that we could continue to give our donations to other local organisations. It was put to the vote to put the cost of the lunch to £7 for a three course meal. On a show of hands everyone agreed and it was carried. The secretary read the minutes, and thanked all those who worked hard in preparing the tables and waiting on everyone. The secretary stated without all these people the Lunch would not take place. The minutes were read and duly signed. The next lunch will be April 24th which we will be celebrating St Georges Day. The menu will be Roast Beef and all the trimmings plus Apple pie and cream. Look forward to seeing you all, everyone are welcome. We are always looking for helpers as these are all volunteers to serve the meal.